Super Hero Boy: DVD Review : Music, Music Everywhere! 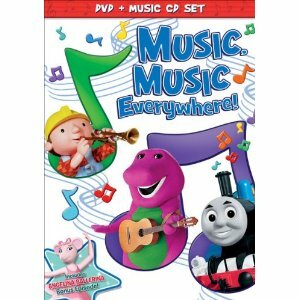 DVD Review : Music, Music Everywhere! Music, Music Everywhere! Is a two disc dvd set from Hit Entertainment that includes a DVD full of episodes from your favorite Hit Entertainment friends : Bob The Builder, Barney, Thomas & Friends, Kipper and Angelina Ballerina. As well a music cd is included that includes favorites songs performed by your Hit Entertainment friends! So you can watch the episodes at home and take the cd along with you in the car or just listen around the house! The episodes included on this set are : Barney - Play Piano With me, Bob The Builder - Roley's Important Job, Thomas & Friends - Tuneful Toots, Kipper - Arnold's Drum and Angelina Ballerina - Angelina's Musical Day. All are music themed episodes which will get your kids singing and dancing along! Connor just joined the choir at church and he's super excited about this dvd as he's totally into singing at the moment "like he does at church". Connor especially liked the episode with Kipper and Arnold's Drum. Though Kipper is usually not his favorite I think this particular episode hit a home run as Connor has a hard time containing himself at times and Kipper's friend Arnold gets a drum and can not stop playing it through their entire picnic. Kipper has to come up with a plan to keep his friend busy and quiet but in the end everyone has fun and ends up making music together. Music, Music Everywhere! is available right now and you can pick up your copy on Amazon ! Disclosure: We were given a copy of Music, Music Everywhere! free of charge, we were not compensated for this post in any other way. My opinions and comments on items we review are always my own and are never influenced by sponsors.